Stocksbridge Park Steels take on third-placed Pontefract Collieries at Bracken Moor where three-points would not only give Steels relegation battle a welcome boost, but would also help neighbours Sheffield FC in their quest for a play-off spot. Likewise, Club could return the compliment by beating Wisbech Town at the Coach & Horses. That would see Gavin Smith side go third if Chris Hilton’s men have beaten Pontefract. Pontefract’s form has been inconsistent since the turn of the year; in five games they have won two, lost two and drawn the other and arrive having lost the last two away including a 7-3 thumping at another of the relegation-threatened sides, Spalding United. 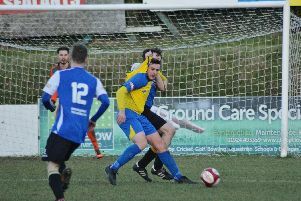 Collieries beat Stocksbridge 2-0 in the reverse fixture in early September. However, Hilton’s side have shown in recent games they have more than enough in their locker to pull away from danger and go into the game having lost just two of the last six. “The players are very upbeat and want to put the result against Morpeth behind them,” said Hilton. “They are by the far the best team in the league so there is no point beating ourselves up over the result. We’ve told the players if they play like they did in the first half against Morpeth we’ll pick up results. “We’ve got two home games in a row now against Pontefract then Brighouse Town, yes they are against sides in the top three, but we’re at home and are always confident we can pick up points against anyone. “They (Pontefract) have a good front three and are big strong side. I think they took people by surprise when they came up but I think teams have got used to their play style of play. Hilton made two more signings this week. “Kler Heh has re-joined us after a spell playing abroad. “His international clearance has come through so he will be in the squad for Saturday. He did very well for us when he was on loan from Sheffield United and loved his time here. Sheffield FC’s home form of late has been tremendous with seven wins from the last eight league games. That’s been instrumental in catapulting Gavin Smith’s side up to four the in the table. And Club should extend that run against a Wisbech side locked in a battle with six other teams fighting to avoid the bottom two slots and relegation from the East Division. The visitors arrive having won just two of the last 12 league games away from home. 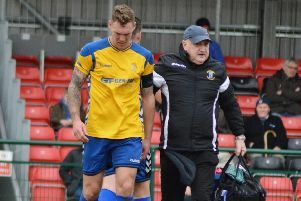 However, both have come since the turn of the year at Spalding and Loughborough Dynamo, which suggests they will not be coming to the Coach and Horses ground to make the numbers. Frickley Athletic travel to Stamford just a fortnight after coming from behind to beat the Lincolnshire side 4-1 at Westfield Lane. Premier Division: Buxton v Gainsbororugh Town, Hyde United v Matlock Town.